Milatjari Pumani is a senior Pitjantjatjara artist working through Mimili Maku Arts Centre in the remote community of Mimili in the Southern Desert region. 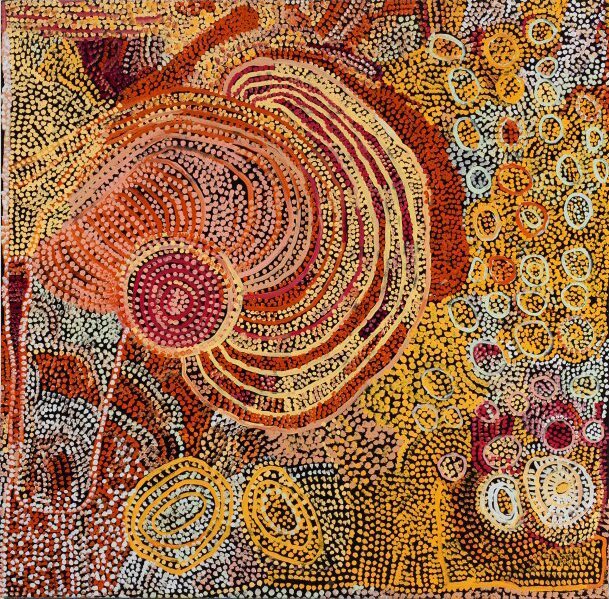 The unique cultural inheritance and visual language of artists from this region has come to the fore in recent years as art centres are established throughout the Anangu Pitjantjatjara Yankunytjatjara Lands. These art centres provide the necessary infrastructure for artists to work in a culturally appropriate manner, surrounded by family, actively enhancing the social, cultural and economic conditions of Aboriginal communities. In the major work 'Ngura Walytja Antara' 2012 Pumani focuses on Antara, a site known for its abundance of maku (witchetty grubs). Pumani would often camp at Antara as a child and would spend time with her mother collecting bush foods, while her father hunted for kangaroo and goanna. Pumani’s brilliant colouration in roughly applied dots and expressive iconography scattered across the canvas, celebrate her memories of these trips and capture her attachment to place. Her painting style shows her enjoyment in the act of painting itself and evidences the confidence and freedom of expression that comes from a lifetime of learning and deep cultural knowledge.